Handbags, Oh how I love a good bag! My whole life I've been a handbag/purse kind of gal. I've never been a super skinny person so going clothes shopping sometimes hasn't always been fun but handbag shopping always has. Over the years I've bought, sold ,traded & donated a lot of handbags. Some low end to medium price range and a few luxury. But also through the years I've come to have a nice vintage collection. Today I thought id share with you my leather handbags. My tips on buying them, where I bought them and how much I paid. This post may not be for everyone due to the fact that they are all leather. Personally I believe buying Vintage leather is recycling and giving new life to an otherwise forgotten about piece. Long Strap Shoulder Bags: Both are Vintage 1950s. 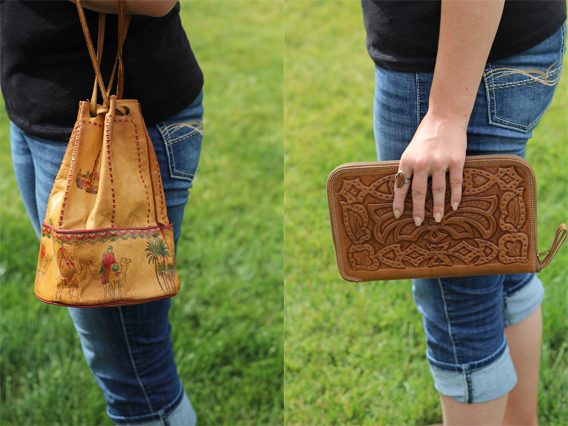 Beautifully tooled bags. One was made in Mexico. Both are great bags. And I use them on a regular basis. That being said they don't hold a ton but are great for days when you don't need a lot or aren't in the mood to carry a 10lb + bag. They were both bought at a local flea market/antique store one for $12 and the other around $19. Great deals on two gorgeous bags. Clutch Style: These two were bought at a yard sale & estate sale. Both were on the higher end of what I normally pay for a Vintage clutch bags. Each costing around $5 each (Yes, That's not very much but when shopping at a yard sale or estate I normally only pay a few dollars.) The Thunder Bird clutch is on the newer side 80s-90s I'm guessing but cute none the less. Bucket Style & Satchel Bag: The bucket style bag is rather old. I would guess made sometime in the 1930s. It's a souvenir bag from the Middle east. One of the more interesting bags in my collection. It came from a thrift store and I believe I paid a few dollars for it. It was an amazing bargain for sure. And the satchel is 1950s. From Mexico. It has a great look to it. Made very nicely. It does have some wear to it. But that's what makes it charming. And it came in around $2 from an Estate sale. Score! What to look for when buying Vintage Leather Bags? Condition: Make sure the bag isn't falling apart. Look for any holes or cracks in the leather. Over time leather will dry out and crack if not properly cared for. Smell: Like anything Vintage it's been around the block a time or two, and sometimes can having varying smells of must or cigarette smoke. So be on the look out, Nobody wants a stinky bag! Usability: Make sure it will work for you. 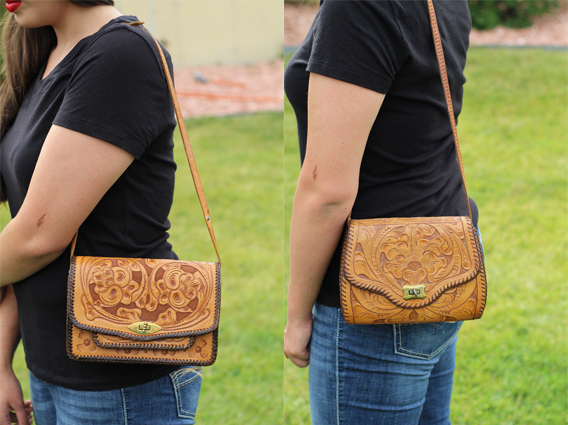 Unlike todays bags Vintage aren't usually going to be large or have long crossbody straps or even be that large. Ladies of yesteryear didn't seam to have to carry all her belongings, the kitchen sink & modern tech things like an Iphone or Ipad. My favorite place to find Vintage Bags are thrift shops and estate sales. There are tons of websites where you can buy them but you don't get the thrill of the hunt nor do you find $2 dollar bargains. Hope you enjoyed this style of post. If you did please let me know, I have other vintage collections I'd love to share. On the off chance that you are medium constructed, at that point an extensive tote may not suit you. Having a medium pack will suit your motivation as you would prefer not to convey with you a vast terrible and ruin your picture.